The Salmon Run is an awesome contest. 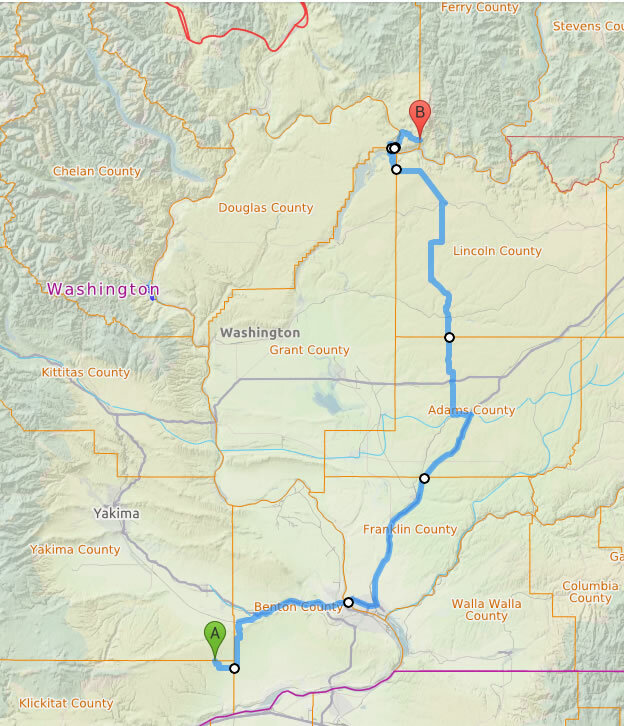 Even in years like 2017 when conditions are poor, I cannot resist the two day rove through western and central Washington. This year, I didn’t modify my route, but I reconfigured my antennas in anticipation of poor HF conditions. The day before the contest, I published my route and schedule. I’ve used this route for five years now, with only a few tweaks each time. The two-day, 22 county trek begins on the King–Pierce county line about an hour south of my home. It ends near the Grand Coulee Dam on the Okanagon–Ferry county line. This map shows the route for Saturday (click for larger images). 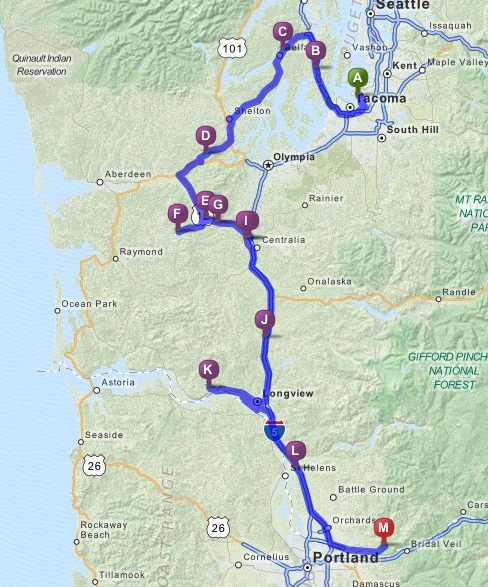 It starts on the King (KING)–Pierce (PIE) county line and then goes through Kittitas (KITS), Mason (MAS), Grays Harbor (GRAY), Pacific (PAC), Thurston (THU), Lewis (LEW), Cowlitz (COW), Wahkiakum (WAH), back through COW, into Clark (CLAR) and ends on the CLAR–Skamania (SKAM) county line for the last hour or so until the contest suspends at midnight. From there, I drive an hour east to a motel in The Dalles, OR for a few hours of sleep and a hot shower. My main contesting rig is still a Kenwood TS-480SAT at 100W. A Yaesu FT-857D with a LDG tuner serves as a second rig and was particularly useful for exploring other bands. A second FT-857D monitored either 6m or 2m SSB, and fed a 2m and 6m brick. Finally, a TYT-9800 quad band rig monitored 6m FM and 2m FM simplex frequencies. I’ve never made a HF contest QSO on 52.525 MHz FM, but I hold out hope that someday it will happen. The black box sitting on the left controls a remote antenna switch that switches between antennas and swaps antennas between the Kenwood and Yaesu radios. A K1EL WinKeyer can be seen on top of the LDG tuner and is loaded with macros for the contest. I load one macro on the fly with my county (or counties), and the keyer does much of the work for me in calling CQ and giving reports. At the lower left, an antenna rotor control can be seen. This is used to rotate the front VHF antenna stack. The operating position has four remote heads (TS-480, 2 FT-857Ds, and a TYT 9800 head) mounted on a piece of sheet metal. On top of the dash, two Android devices and a GPS are mounted. One Android serves as a 24-hr clock and the other provides real-time information on the current county. A TomTom GPS is is pre-loaded with the day’s route and way-points. The antenna farm included three home-built screwdriver antennas mounted in the truck bed. One was mounted behind the tool box. Two other screwdrivers are on the rear right side and rear left side of the truck bed. A 6m whip and a 2m whip on magnet mounts are attached to the roof for monitoring the FM portions of these bands. By using three screwdriver antennas, I can minimize the amount of time required for band changes. The antennas have two standard configurations. By day, they are set up for 15m (left front), 20m (right rear) and 40m (left rear), and by night, 20m (left front), 40m (right rear) and 80m (left rear). The antennas are optimized for the night-time configuration. The 40M/80M screwdriver has a large capacitance hat. Additionally, the whip is cut so that the antenna is just under the legal height (14′ in Washington state) when tuned for the CW portion of 80M. The 20M/40M screwdriver has a smaller capacitance hat and, again, the whip is cut so that the length is barely street legal in the CW portion of 40M. The 15M/20M whip is a bit shorter and has no capacitance hat so that it can go down to the 15M phone band and as high as 40 CW. In recent years, I mounted one of the screwdrivers on the front of the truck, and used a 10m whip behind the driver’s seat that, with a tuner, serves as a backup 10-40m vertical. This year I figured that 10m would be dead. And, in any case, I could use a tuner with the 15m antenna on 10m if the band opened. This year, I moved the third screwdriver to the rear in place of the 10m whip. The antenna is much more effective here than on the front of the truck. In the front, I returned to a configuration I used several years ago, with a 6m hex beam and a four element WA6VJB “cheap yagi” for 2m mounted in a rotor on the front of the truck. The stack is built to be street legal (i.e. it doesn’t exceed the overhang limits) and could be rotated while in motion. These antennas are for the weak signal portions of 2m and 6m. This worked well this year. Early on Saturday when HF was in bad shape, I made a fair number of QSOs on 144.2 MHz and 50.125 MHz. The hour drive from home to the KING/PIE county line gives me a chance to re-familiarize myself with the equipment, antenna switching and antenna tuning, and to make sure everything seems to be working. There were only a few minor tweaks to be made when I arrived a few minutes before the contest. A quick run through the bands showed that forty meters was quiet. Twenty meters at least had some signals. In recent years, Scandinavian contest signals have boomed in on 20m for the first half day. This year…nada. I worked only 10 stations (20 QSOs) on 20m in the first 25 minutes. The last pair of QSOs was with W7DX, for 500 bonus points. I heard my buddies Mike, KD7TS, and Ray, W7GLF, chatting on 144.200 MHz, so I worked them on SSB (4 QSOs). They then worked me again on CW (4 more!). I heard mostly weak signals on 20m SSB, and only managed to complete one QSO before, out of frustration, calling CQ on 50.125 MHz. My buddy Tom, KE7SW responded immediately. He offered to work me on 2m SSB as well. And we kept going…40m, 20m, 15m, 10m, and 80m, for a total of 14 SSB QSOs. An hour into the contest, 20m CW seemed to pick up a little; In the final 10 minutes at this stop I worked a few more stations on 20m SSB, including W7DX for another 500 bonus points. The 30 minute trip through PIE to KITS produced a discouraging zero additional QSOs; however, I managed a handful of in-motion QSOs in KITS, including CW and SSB QSOs with KD7TS on 2m FM. I spent 25 minutes on the KITS/MAS line, on a dirt road a short distance off of State Route 3, but I couldn’t get a run going and left with only a handful of new contacts. Things picked up slightly as I headed to the PAC/GRAY line, (23 QSOs in 90 minutes), including making a couple of rare 15m CW QSOs. The PAC/GRAY line is on a gravel road between Oakville and Brooklyn. I sat there for 90 minutes and worked 25 stations (3.6 minutes per contact), so the rate was creeping up. Nine of the contacts happened on 40m, and 7 were on VHF with KD7UO, W7GLF, and KG7P. The rate went down again (5 minutes per contact) in the 25 minute trip to the THU/LEW county line stop, and pretty much stayed there during the stop. At this time (2330z), 20m started closing and 40m started opening up a bit. I made only one more 20m QSO after that at 0123z with K9FD in Hawaii. Thinking that I might be able to work Japan as well, I CQed and tuned around on 20m CW, but turned up nothing. Contacts in COW were all in motion on the way to (and from) WAH; I worked a respectable 25 QSOs in 35 minutes, all on 40 CW. I stopped in WAH for about 90 minutes starting at 7:15pm, and 40m was still productive for about 30 of those minutes. A switch to 80m got a couple of respectable runs going on both SSB and CW for the next hour. The return trip took me back into COW, where I was able to re-work some of those 80m SSB stations. The last stop of the day was on the CLAR/SKAM county line, and I arrived at 0550z (10:50 PDT). The air was quite thick with smoke from the Eagle Creek fire–like being in a bar before Washington’s indoor smoking ban. In past years, the contest slowed considerably in the last hour, and this year was no exception. I worked a handful of stations on 80m CW and a couple on 40 CW. While this was happening, I noticed some activity on 2m FM. I worked W7TKX on 146.52 MHz, and a bit later K7YUF, W7RC, K7RMO, WB7PGB, KG7VAK, KG7YOL responded to my CQs. Indeed, it turned into miniature QSO party/chat net. KG7YOL and WB7PGB were kind enough to work me on 6m as well. I was quite grateful for the QSOs and the company. At midnight, I set off for a 70 minute journey to a motel in The Dalles. Interstate 84 was closed most of the way on account of the Eagle Creek fire, so I stayed on the Washington side on Hwy 20 most of the way. At one point, I could see a “small” section of the massive fire right across the Columbia river. In the dark, it looked like an enormous vertical wall of flames. It was indescribably surreal. Sunday morning I was on the road by 6:30 PDT for a 9:00am appointment with the YAK/KLI line. In the past, I could pull onto a bit of double track etched into a field of sagebrush, putting me on the county line about 10 feet off the road (alongside the sign). This year, however, it was a plowed field and driving on someone’s agricultural field was not an option. Instead, I had to squeeze my truck off the shoulder on a rather steep bank, with the front of the truck just breaching Yakima county. The photo doesn’t really show how uncomfortably steep this position was. Twenty meters was so-so on Sunday morning. I made 16 contacts in 40 minutes (2.5 minutes/contact). Of course, 16 contacts means 32 QSOs on a county line. I left a bit early and headed for an unplanned 15 minute stop on the KLI/BEN line. There I worked 12 stations, mostly on 20m. I continued through BEN into FRA for about 90 minutes and worked 40 more stations (2.25 min/contact), all on 20m. A ten minutes stop was scheduled for the FRA/ADA county line. Here, I turned down a relatively unused county line road, and stopped right in the middle to put each side of the truck in a different county. I caught a few stations on 80m SSB and a couple on 20m SSB. Fortunately, no other traffic used the road during my brief stay. Shortly after noon, I went back to 20m CW for the 45 minute trip through ADA, making about 26 QSOs in motion. An unplanned 10m stop on the LIN/ADA line produced a handful of 80m SSB QSOs, most were on the frequency that K7IDX kindly offered. Afterward, I pounced on a nearby strong signal from WW7LW and got confused…he kept repeating my report back to me. The confusion arose because WW7LW was also on the LIN/ADA county line in a wheat field about 1/2 mile from me. Unfortunately, it was in the wrong direction for an eyeball QSO, but I appreciated the 4 (2×2) QSOs. The QSO rate slowed during the 45 minute journey through LIN. Forty meters was dead (with a high noise level). I managed a few QSOs on 20m on SSB and CW, and heard a rare signal on 15m CW. It was K7TQ/M in nearby ADA county. With a little over 2.5 hours remaining, I hit GRAN county. The QSO rate was moderate on 20 CW during the 15 minutes to the GRAN/DOU county line. The GRAN/DOU county line is accessible on the edge of a dirt road with massive power transmission lines a few hundred yards away. In past years, this location has produced sustained runs on 20m and 40m. In 2017, the location was moderately productive with 26 contacts (52 contest QSOs) in 45 minutes on 20m CW and 75m SSB. Forty meters was (still) dead, and my CQs on 80m CW produced nothing. With 100 minutes left in the contest, I made a 30 minute dash through GRAN, briefly back into DOU, then into OKA, making about 20 20m QSOs en route. This landed me on the OKA/FER county line for the last 70 minutes of the contest. Here, I made a couple more 20m QSOs before turning to 80m SSB. I was looking for K7IDX, but found WW7LW again on LIN/ADA for 4 more QSOs. Next I found Todd, K7TAO, a SOTA buddy, who offered to spot me and give up his frequency. After the 80m SSB QSOs dried up, I gave 40m CW a shot, but only managed 2 QSO. Next was 20 SSB, where I worked N8II. We QSYed to 20m CW and worked again. I suspect he spotted me there, because I got a small run going after that. For the last 15 minutes of the 2017 Salmon Run, I went to 80m CW, but could hear nothing. So I stubbornly started calling CQ. After a few minutes I got a small run going (5 contacts, 10 QSOs) that took me right up to 2359z. It was a good way to end. The 4 hour trip back to Redmond was uneventful. Just after leaving the Grand Coulee area, a light rain started that persisted much of the trip. This was good. The entire region really needs the rain, if only to help extinguish numerous forest fires. The trip through Snoqualmie pass started with heavy smoke from the Jolly Mountain fire that gave way to more rain, fog and traffic congestion. This part of the trip was made more pleasant because I found four other hams on 146.52 making the same trip. After eliminating duplicates, I ended up with 630 QSOs–about 80 fewer than last year. 432 of these were CW and 198 were phone. Compared to last year, there were a lot more phone QSOs, in part because I was focusing on 80m SSB much more this year. For the past couple of years, I worked W7DX only on CW. This year, I worked ’em once on CW and many times on SSB for 1000 bonus points. My total multipliers were 70, down from 76 last year. Multipliers included 37 states (down from 38), 31 Washington counties (up from 28), and 2 Canadian provinces (BC, ON, down from 4 last year). I worked no DX! Spending time on 80m SSB really helped find some of the rarer counties. The missed counties were ASO, COW, DOU, GAR, PEND, SAN, WAH, and WAL (three of these counties I activated). The missing states were AK, AR, DE, ME, MS, MT, ND, NH, RI, SD, VT, and WY. The final preliminary score, including the bonus points, was 119,440, down from 154,628, but almost identical to 2015’s 119,636. That year, a solar flare wiped out HF on Sunday. A few special mentions and thank-yous are in order. First, Bruce, K7IDX, repeatedly offered me his frequency on 80m and spotting me. This resulted in a lot of those 80m phone QSOs, bumped up my multiplier count, and, when I was in a rare county, gave other folks the opportunity pick up new multipliers. Todd, W7TAO, did the same thing the one time I worked him. Tom, KE7SW, ran the bands with me when things were otherwise relatively slow. Ray, W7GLF, Mike, KD7TS, and Dale, KD7UO, let me interrupt them on 2m SSB, and then took the time to work me on 2m and 6m in SSB and CW. Finally, a bunch of friendly hams hanging out on 146.52 near Portland, K7YUF, W7RC, K7RMO, WB7PGB, KG7VAK, and KG7YOL were “game” working me in the final hours of Saturday night. In summary, conditions on Saturday were not so good this year. Participation seems lower, although the conditions may have made it just seem that way. We definitely could have used more mobile stations. But I had an excellent run and a good time. Sometimes these mobile contests feel like a struggle trying to safely balance navigating, driving, operating and logging. This time, I had a good groove going, and was able to pull it all off without stress or frustration. Perhaps the lower QSO rate helped? It certainly helped that my equipment and antennas were working well. I look forward to next year’s Salmon Run!